Track made by Jalnervion from scratch, with BOBS TRACK BUILDER, and some textures made by LeonardasF1 used with permission. Simply extract the rar, into your \Rfactor\gamedata\ folder and overwrite. Hayballs are semi transparent in some places. Shadows are not working already. Pit flaggers doesn't work either. I will try to improve in the future. This track is free for use. I don't give permission to use this track for commercial use. Any modification of the track must be comunicated to me. I hope you like it. Enjoy. 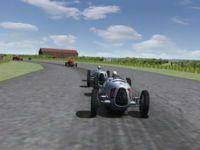 There are currently no setups for 1950 Silverstone. Add a Setup.